We traveled Route 66 to visit friends in Santa Fe this past week. This vacation wasn't about eating, and there probably isn't anything below that I'd put on my must-eat-again list, but there's some good stuff. We didn't go out for breakfast except in Santa Fe -- the only notable hotel breakfast bar was in Las Vegas, NM: great red and green chile sauce on very fresh scrambled eggs makes for a wonderful wake-up. On the subject of motel breakfast, only one (in Topeka) had real butter, the rest all margarine or blend spreads. A Route 66 classic, still doing it right. 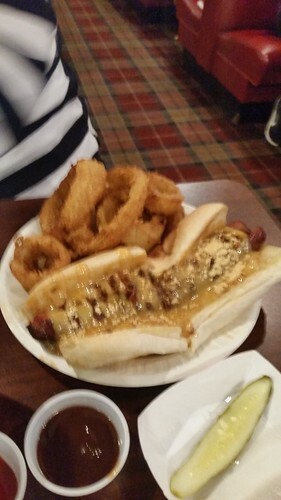 Their "cozy dog" is the originator of the corn dog: crisp, a little spicy, a decent dog on a popsicle stick. Accompanied by very good fresh cut fries. Condiments available for use include ketchup, mustard, pickles and peperoncinis. Note: Bob Waldmire, son of the founder of Cozy Dog, was a Route 66 enthusiast, who built a Land Yacht out of an old school bus, now resident in Pontiac, IL. This place was a nice walk from our hotel in St. Louis, on a beautiful evening. Sue found it on a Route 66 episode of Triple D, but it's a decent gastropub kind of spot. The pretzel with Welsh Rarebit was a huge twisty loaf of bread with a decent pretzel crust (but a bit doughy for a pretzel), with a tasty cheese sauce for dipping. The pork belly poutine was very tasty (but the gravy was closer to a broth, making things rather wet by the end). Their house salad was very good with a molasses whisky vinaigrette and provel cheese. I'd go back if I was in that neighborhood, it's classier than a Triple D endorsement usually implies, and very tasty. We should have hit Ted Drews for dessert Friday Night, but were pretty tired from driving and biking (over the Chain of Rocks bridge). Sadly, they weren't open on Saturday until 11AM, so we'll have to try them on another trip. Instead, Sue stopped for Gooey Butter Cake, one of St. Louis' specialties (this after having breakfast at the hotel). Park Avenue Coffee has several locations, and multiple flavors. We picked up a slice each of Original and Turtle. A little sweet for my tastes, this actually was better a day later when it had set up a little more. 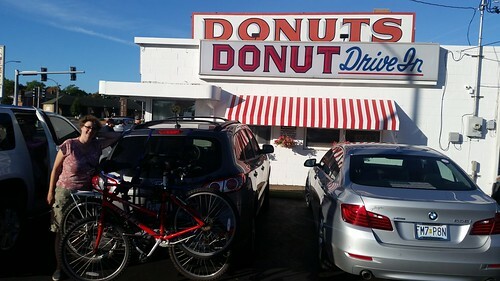 ...and donuts at the Donut Drive In, another Route 66 classic. We only got one apiece, a bavarian cream for me, and a basic chocolate donut for Sue. Very good, I'd go back. I hope you knew about the chicken fried steak along the route in Vinita, OK and Oklahoma City. 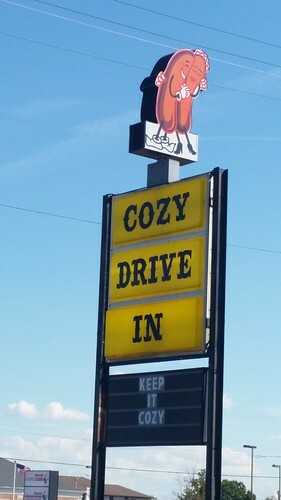 Ram4 wrote: I hope you knew about the chicken fried steak along the route in Vinita, OK and Oklahoma City. I am not a fan of cream gravy, so chicken fried steak held no interest. A couple places in NM did a green chile version, but there was always something else on the menu that appealed more. Continuing where I left off. It's called that because yes, they throw them at you. It's a temple to excess, glorious excess. Entrees come with two sides, plus the "pass-arounds" which include the aforementioned rolls, pillowy soft and served with sorghum molasses; fried okra coins (mmmm); fried potatoes and onions (kind of like breakfast potatoes); black eyed peas; and macaroni and tomatoes (the latter two never got to our table for some reason, but we had plenty to eat). I ordered the fried chicken, which was a breast, wing and leg of the biggest damn chicken I've ever seen, with greens and cucumbers and onions as my sides. The greens had a nice vinegar and onion note, the cucumbers refreshing. That big chicken managed to be tender and juicy, perfectly cooked. Not the crispest fried chicken, but tasty, and well-seasoned. Sue ordered the Hog Jowls, one of their specialties. What came out looked like a huge platter of fried thick-cut bacon. Wonderfully crisp and salty... but too much of a good thing. We took much of it with us on the road, and even in the cooler for a couple days it stayed crisp and made for good snacks. I'm not sure I remember what her sides were, possibly cottage cheese and sweet potato fries. The last example of an old chain. Good burger, great prices (when is the last time you saw a milkshake for $1.89?). Still doing a good business, not just Route 66-ers, as it was packed at lunchtime. Fries and fried pickle spears were terrific too. Modern, not kitsch, but the best selection I've ever seen of soda. While there's no penny-an-ounce tax, it isn't cheap: everything is $2.49 a bottle (9-16oz). We picked up some weird stuff for an upcoming party, didn't drink anything. 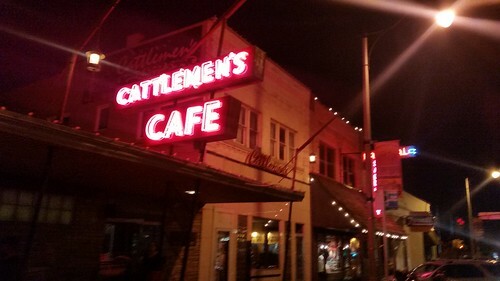 Everyone talks about the 72-ounce steak at the Big Texan in Amarillo, but the word was that the Cattlemen's is a better steak. I didn't try the Big Texan, but was certainly pleased by the Cattlemen's: warm service, steaks grilled perfectly (rib eye for her, sirloin for me), baked potatoes just right (real sour cream but fake butter? WTF? ), salad with blue cheese dressing, fluffy rolls. Nice dark-wood paneled place, but definitely not stuffy: people in tank tops and shorts. It may not be dry-aged in a salt cave, but it was a very tasty steak, reasonable prices. I want to make this trip someday, so I'm enjoying all this. Thanks very much, Joel, and keep on posting. The EZ-66 book we have recommended a stop in Hydro, OK for a tour of the peanut plant there. However, all that we could find is the Nutopia store a little further from the highway. Good peanuts (big sweet florida runners), candy, and pecans were purchased. 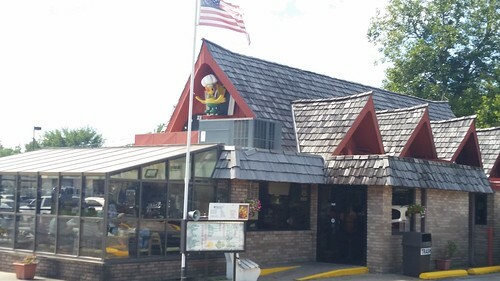 We asked the woman there if she knew a place to get the classic Oklahoma "Onion Burger" and she recommended a place called the Double Six Diner in Weatherford. Google was particularly unhelpful at this, it kept trying to direct me to a Domino's Express... and it turns out that's not a pizza place, but rather a convenience store chain, beside a Shell station. 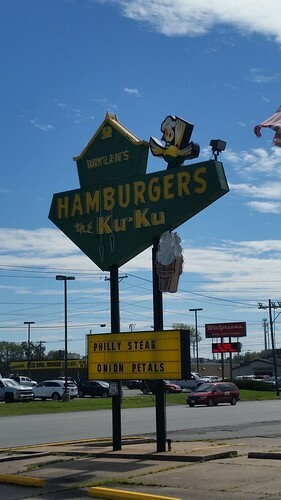 It was a pretty good burger (very good onion rings), but not a smashed-into-the-onions Oklahoma onion burger. Their barbecue looked pretty good too (big smoker out front). Since there's not much Texas on Route 66 (only like 120 miles, second least behind Kansas), we decided this was the night for Tex/Mex. Google steered us to El Tejevan, only a short distance away (but you can't get there from here because of one-way frontage roads). Little place serving more Mex than Tex. 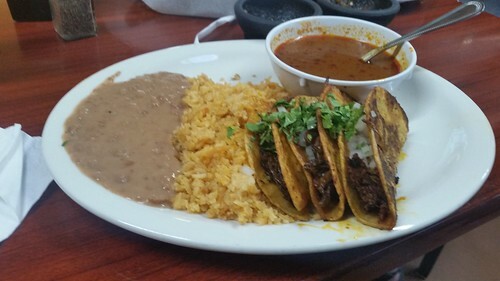 Birria tacos and chicken flautas were on their specials, so that's what we ordered. The tacos were thin and fried crisp, and came with a cup of wonderfully spicy and rich consomme. The flautas were crisp and fresh. Good, hot table salsa with fresh, warm chips. Friendly service, good prices. It'd probably be a no-brainer GNR if it were here. Lunch was picnic after a little mountain biking in Palo Duro Canyon, and a visit to the Cadillac Ranch outside Amarillo. On the kitschier side of things, the Midpoint Cafe in Adrian, Texas, is very much decorated in 66 splendor. Adjacent to it is a gift shop with a pickup truck signed by many passers-by. The Midpoint serves some really good "ugly crust" pie. Not sure why it's called that: the crust was appropriately tender and flaky, and the slice of chocolate chess was very good. They're apparently only serving hot food on select days -- Tuesday isn't one of them. Very warm and friendly service, a bunch of folks commiserated over Tom Petty's passing. Tucumcari, NM looked on the map to be a bigger town... but it's nearly dried up and blown away. Outside of the Route 66 strip, and a cluster of chain restaurants, motels and gas stations near the Interstate, it's pretty sad. 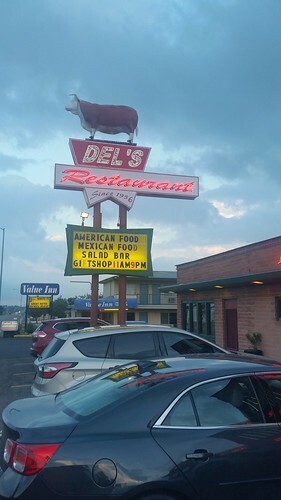 One of the recommended restaurants is Del's. Half the menu is classic American fare, and comes with a trip to the soup and salad bar (black bean and broccoli cheese today), the other half Mexican. I had the crispy catfish, which was very good; I forgot what Sue had. I think maybe the smothered chicken? Service very nice, cozy place. If you hadn't noticed, we sort of screamed across Missouri, Oklahoma and Texas. We spent more time in New Mexico. Las Vegas, NM was once the biggest city in the state, until rail expanded beyond the Atchinson, Topeka and Santa Fe line which parallels the downtown. 900 buildings on the National Register of Historic Places -- great town to walk around. We dropped into Charlie's Bakery for an afternoon pick-me-up. 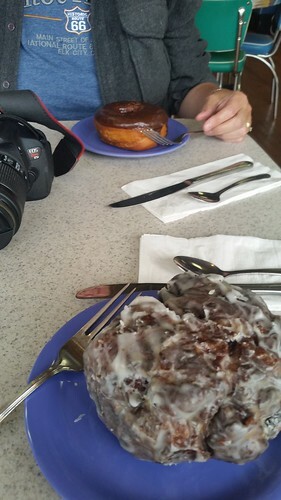 This apple fritter is bigger (much bigger) than Old Fashioned's, but not as good, sadly. Chocolate donut very good -- also very big. Friendly service. They also make their own flour tortillas -- food being served looked very good, and if we weren't eating out every day, I'd have snagged a bag of those tortillas. For dinner, two of the top-reviewed restaurants in town were directly across from our motel: Pino's (labeled as American/New Mexico), and Little Saigon. I'm always nervous about Asian in small towns... so we skipped. Pino's was just OK: more Tex-Mex than New Mex. 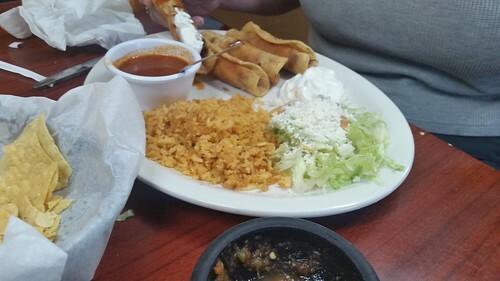 We both ordered combo platters: mine with a hatch chile relleno (pretty good) in red chile sauce (less so); Sue's with a tamale in green (pretty good). Huge platters of food... but not my favorite of the week by any estimate. What was a real surprise, though is the breakfast buffet at the Best Western Plus Montezuma Inn & Suites -- freshest tasting scrambled eggs, and damned fine green chile sauce. Nice facility, decent price, I'd highly recommend it. The magic with Route 66 is stopping as much as possible along the way. If you are driving for more than an hour at a time, something is wrong. But most people don't have 2-3 weeks for a trip like that (nor do they want to). And when is the last time I saw a 1.89 milkshake? In N Out Burger for $1.99 is pretty close. I loved Lamberts in Branson, MO. Their portions are crazy! Glad you got to visit an iconic piece of americana. Ram4 wrote: The magic with Route 66 is stopping as much as possible along the way. If you are driving for more than an hour at a time, something is wrong. But most people don't have 2-3 weeks for a trip like that (nor do they want to). Yeah, we only had 10 days, two of which were visiting friends in Santa Fe. So most days were frequent stops until about 2-3PM, at which point we'd realize we had to move a little faster, and we'd skip the next 14 gift shops, Route 66 museums and old neon. The EZ-66 book is really designed to do a page or three a day -- there's enough side trips and alternate routes to keep you busy. But it's also aimed at the 66 enthusiast who wants to drive every inch of the original pavement, which mattered less to us (we did take it where we could, but not where it was dirt). ..which brings us to those two days visiting friends in Santa Fe, where we ate very, very well. First thing we did was wander the plaza. Years ago, there was the famous "Roque's Carnitas" which I'd posted about in 2005. The current fajitas cart on the plaza is, sadly, crap. Gristly, flavorless beef, insipid salsa. 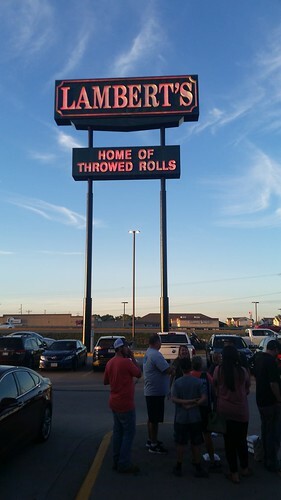 Go for the tamales, they were pretty good. Radish and Rye is our friends' new favorite restaurant, with farm-to-table and American spirits (Bourbon as well as Rye) as the features. Good cocktail menu, although I can't remember what it was I had. Their corn chowder with bone marrow is outstanding -- a halved thighbone floating in the soup provides lots of rich fatty goodness. Sauteed trout with a corn-chile cake, and lamb t-bones with a salad of rye berries and bacon were both very good. A late breakfast the next day at Tea House, a well known spot on Santa Fe's Canyon Road (full of galleries and boutiques). 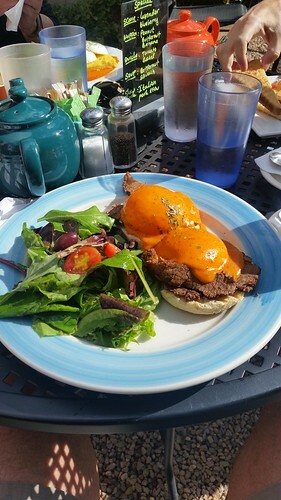 They've got a variety of versions of Eggs Benedict, including a classic (which Sue had) and brisket with red chile hollandaise (mine). Delicious, and very good coffee and huge selection of tea. Later in the day we stopped at a food truck of a friend of our hosts' son, [url=food truck]Freezie Fresh[/url] -- Thai rolled ice cream. I'm not sure I'm in love with the gimmick: it's pretty, and tasty, but seems like mainly a way to pay more for less ice cream. For dinner, we researched the area's best green chile cheeseburgers, and drove out to Madrid -- an old mining town, now artist colony, that apparently revels in its lack of cell service. The Mine Shaft provides a very good burger. Their Mad Chile is served with a battered, fried Hatch chile, as well as chopped chiles on the burger. Good beef, good value. 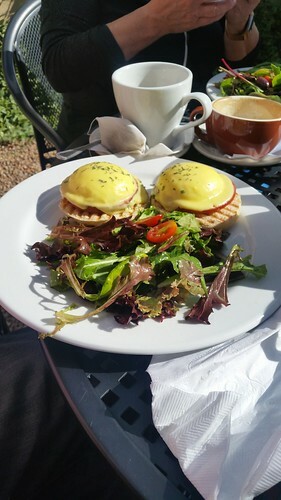 Saturday morning, before taking off for our bat-out-of-hell driving home (two days for what took us six days on the way out), we had breakfast at Tecolote, another Santa Fe staple, recently expanded. Their motto is "Great breakfast, no toast" -- didn't miss the toast, as their pastry basket served with the meals had terrific muffins and other items. The Sheepherder’s Breakfast had potatoes, peppers, onions, two eggs, cheddar, and red and green chile sauce. Didn't look very big, but was very filling. Sue had a short stack of their "batters" -- giant pancakes, good syrup. Wrapping this up was our bat-out-of-hell drive home, two days instead of the six outward, taking a more northerly route so we could get to Topeka and Jefferson City (yes that's out of the way, but we're collecting pictures of us at each state capitol). We'd hoped timing would be good for a lunch in Kansas City, but we were too tired to get past Salinas... which has pretty good barbecue too. 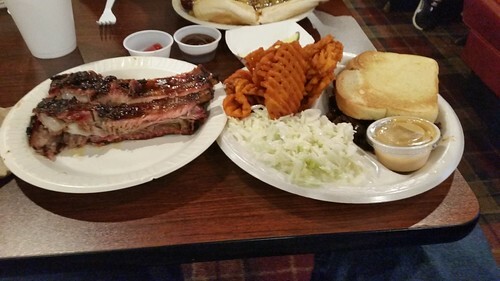 We got one combo platter of ribs (four very large - like the spare + the baby back or something like that) and burnt ends, and a "Slammer" described as a polish topped with beef, pork and their special sauce. That was pretty awesome. The ribs had obviously been sitting on a steam table for a while but still had a good pull off the bone, pretty tasty. The burnt ends (under the Texas toast in the pic below) could use a little more seasoning. Sides were very good onion rings, pretty good sweet potato fries, and a mediocre slaw. That's about it for roadtrip dining -- lunches were snacks out of the car, last dinner was at home (Mug's pizza). Those ribs look like spares, with the tips still attached. stevez wrote: Those ribs look like spares, with the tips still attached. That sounds about right. Even so, they were large and meaty for spares. Better pigs?